Your Macbook Pro is dirty. The inside is packed with dust and lint, clogging your fan and your air vents, and weighing it down. And it’s slow, and hot, and miserable. Many computer whizzes out there would tell you to grab a can of compressed air, and a Pentalobe P5 screwdriver and clean out your Macbook yourself. There are plenty of tutorials for cleaning your macbook on the web, and that is an option, but it’s not your best option. The materials (compressed air air, special screwdriver, etc.) cost you money. If you mess up, you could break your fan (or worse) and void your warranty. Compressed air isn’t near 100% effective. Here’s my little secret to free, safe, effective Macbook cleanings: The Genius bar. Most Mac owners know of it, but they don’t realize the free services that geniuses will perform. You don’t need to be under warranty or Applecare. 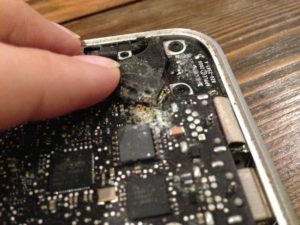 Just show up to your local Apple genius bar, make an appointment, and ask your genius to “clean the dust out of the inside of my mac”. First of all, if they break anything, they’ll replace it. Computer fans are fragile, but when Apple works on your computer, they take full responsibility for all damages. Second of all, it’s free. You can bring Apple any mac, regardless of age (Ok, Maybe not this one), and they will clean it for you. They’ll also do a better job than you will, because Apple technicians are equipped with special computer vacuums which clean out dust more effectively than your standard canned-air. It’s fast too! The entire process takes no more than 10-15 minutes. So what are you waiting for? It’s fast, it’s free, and it will make your computer work so much better. Bring in your Macbook today.